INDIANAPOLIS (AP)— Sam Querrey found success in his third consecutive trip to the semifinals at the Indianapolis Tennis Championships, setting up an all-American final. 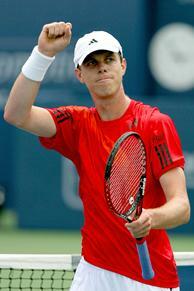 Querrey earned his first berth to the Indianapolis finals, beating Frank Dancevic of Canada 6-4, 6-4 on Saturday. Querrey, ranked 37th in the world and seeded third, will face countryman Robby Ginepri in Sunday’s championship. Querrey, runner-up at Newport on July 12, reached a tournament final for the third time this season. He won an ATP title at Las Vegas in 2008. Querrey’s second championship won’t come easy. Ginepri, who knocked off American John Isner 6-4, 6-3 to advance, won ATP titles at Indianapolis in 2005 and Newport in 2003. The unseeded Ginepri is ranked 95th. 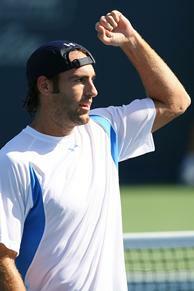 Ginepri, who was unseeded when he won Indianapolis four years ago, is eager to face his good friend for the first time. Querrey, the only seeded player to reach the semifinals, embraced his role as the favorite. Dancevic, the 2007 Indianapolis runner-up, was disappointed with his effort against Querrey. He beat top-seed Dmitry Tursunov of Russia in Friday’s quarterfinals and was seeking his first ATP title. “It doesn’t matter who I was playing, I felt pretty confident,” Dancevic said. “I just have to keep performing like this week after week. Isner, the second tallest player on tour at 6-feet-9, also was searching for his first ATP title.